Congratulations, Italy. You really outdid yourselves in the deep pool department. The Daily Mail’s Andrea Magrath reports the Montegrotto Terme’s Hotel Terme Millepini provides an amazing pool that boasts a world record. The aptly titled Y-40 Deep Joy is reportedly 40 meters deep — although there isn’t any word on how much joy is afforded swimmers. The structure was designed by Emanuele Boaretto and boasts a remarkable diving height equal to a 12-story building. Now if only James Cameron could have held out on filming The Abyss until now. The newfangled pool also has a tunnel constructed right through the middle of the pool, giving visitors the ability to see humans swim around in the depths. Perhaps it’s like SeaWorld but for voyeurs. For the person who gets their thrills from soaking up the sun, there is ample space to laze around at the top. 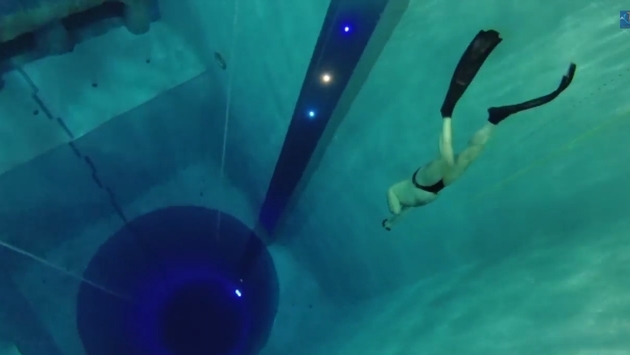 The Telegraph reminds the previous deepest pool was Brussels’ Nemo 33, which gave divers 113 feet of water with which to work.